A range of coffins conforming to international shipping regulations (zinc lined, air-trays, specialist Italian and French coffins). 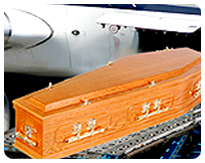 Embalming services suitable for all cases going to tropical climates and elsewhere. Our comprehensive repatriation service accommodates all religious denominations. We understand the requirements & regulations for the shipment of human remains. We will also undertake the liaison at the other side of the deceased’s journey. We are experts at these concerns related to Indian repatriation services. We are recognised by the majority of the Consulates & Embassies in London. We have an in-depth knowledge of their customs, permits, and coffin regulations that need to be adhered to. We care for the next of kin and relatives during their short stay in London to register the death and provide Chapels of Rest if required.